I wouldn't call these "secrets"- certainly there are others doing the same things, but to my knowledge these haven't all been hugely publicized and popularized. I never shared these before because, obviously competition would have driven down their profitability a lot. I'm focusing on techniques that are really fast and / or easy, or using time I'd be spending anyway. For example, selling glyphs can be quite profitable, but only if you make a ton, and are constantly camping the AH and underbidding people, while making sure not to underbid "ridiculous" prices like 3g for a glyph that will probably be selling for 100g next week. You can make gold that way but it's a ton of work, so instead this is all about ways you can make a lot of gold by being super lazy. The crafting professions my characters had maxed out were Blacksmith, Alchemy, and Inscription, so the crafting tips I have apply only to those. All of this is, of course, based on prices on my realm at the time. Check your Auctioneer/Auctionator data and/or the Undermine Journal before sinking a bunch of money into the mats for things I suggest here. Ebonsteel Belt Buckle = Constant free money. Your server may vary, but on mine, this always had a 50-100g profit margin per item (based on buying mats at the time in the AH- if you stock up when mats are cheap, it's even more) But what made this so great was not even the profit margin, but the volume. Good lord, the volume! Simply put, any time any level 85 player of any class gets any belt they expect to keep for any amount of time, they're going to want to buy one of these. So, just craft 20 or 30 at a time and throw them up on the AH. Don't even worry about getting underbid, after a heavy raiding night the people on your realm will clean out the Auction House's stock. Looting a Chaos Orb = Looting 1000g+. Well, the going price for them on my realm in trade chat was around 350g, but why sell them for that when you can consistently make 1000g from them or more? In my case, I just turned them all into Elementium Stormshields. Stormshields are great because they're epic, craft-able, yet only take one orb. The funny thing was, more often than not, there was no one else selling Elementium Stormshields, but 4 or 5 people trying to sell the Elementium Earthguard, which has pretty much the same mats. I found that, if I completed one or two heroics a day, I would wind up selling the Stormshields faster than I could have new orbs to make them, so eventually looting an orb meant making a Stormshield which meant 1000-1500g profit after mats within the next day or two. Just make sure you look at your realm's Undermine Journal data to figure out which is the right piece of gear to make. This works best if you're watching TV or listening to a podcast or the like. I mean, you can seriously not be paying attention to it at all, or even looking at the screen. As long as 50% of your right-clicks hit a stack of herbs, you're still doing fine. How fine? On my realm, Whiptail was going for about 100 g a stack, Inferno Ink for about 90g, and Blackfallow Ink for about 10g. One stack of Whiptail generates on average 1 inferno ink and 6 Blackfallow inks. So, my profit per stack was 90g + (6x10g) - 100g, or 50g/ stack. With my space-out-and-right click method, I could mill about six stacks per minute, which works out to 300g of profit per minute, or 18,000g per hour. So my usual approach was every so often I'd buy a bunch of stacks of Whiptail, and blindly click-mill while watching an episode of archer for about 15 minutes and net a nice several thousand in profit. Every time I logged in I'd buy whatever Whiptail was under my target price, and sell any inferno ink I had when it was above my target price, but it's profitable enough that you don't have to if that kind of thing doesn't interest you. 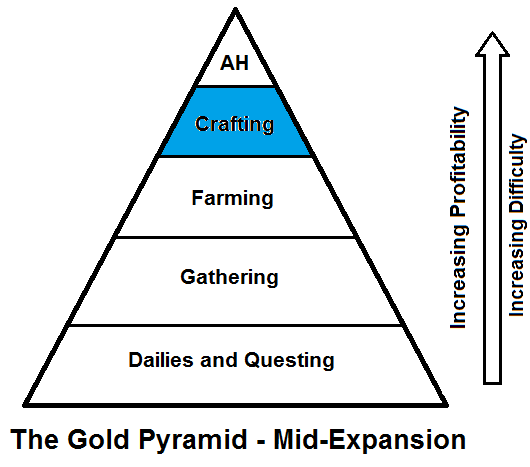 Disregard crafting, acquire Truegold. For a while, with alchemy, I tried to get fancy with how I made money from it. I took flask master, kept on top of the prices and mats for the most popular flasks, and tried to grind them out. Well, screw that. With Alchemy, the way to go is just transmutation. Make sure you've got a ton of pyrium and volatiles, and just transmute Truegold or volatile air once a day, enjoy your random procs and free money, and be done with it. I usually made Truegold just because I was crafting Elementium Stormshields all the time. 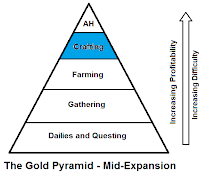 This approach won't get you the highest total amount of gold compared to some others, but it's about the highest gold to time and effort ratio you can get in this game, so why complicate it? Follow the spirit of the guide, not the letter of the guide. When leveling my Blacksmithing, I followed a guide on the internet. I basically did so because, as I said, I'm lazy, and I just wanted to gather up all the mats so I could make everything all at once without constantly commuting between the trainer and the AH/ mailbox. So when it told me to make 5 Ornate Pyrium Belts from 515-520, I did. I took a hefty net loss when I sold them all, but that's just the price of leveling a profession, right? WRONG! The Ornate Pyrium Belt is part of a set; the mats requirements for each item aren't terribly different, but the Belt is almost always going for the cheapest price on the AH. Why? Because everyone else is lazy too, and followed the guide to the letter, just like I did. Lesson learned: if you're a crafter and you're following a popular leveling guide, check for opportunities to make different items that will level you parallel with what suggested in the guide. This is especially true for BS, LW and tailors when they get to the point where they can make the blue PVP set. When in doubt, be lazy. 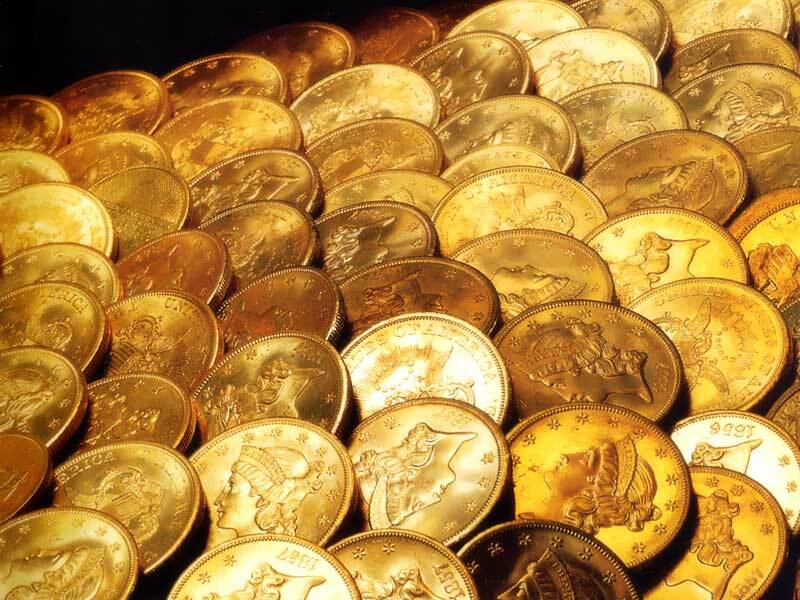 If you want to make a crap-ton of gold in WoW without really trying, your best bet is to find no more than five things that are your big moneymakers. You can still do other things to make money because it can be fun, but if you diversify a lot you'll find that 20% of your time is spent making 80% of your gold, so if you're lazy, why not just slim down to that 20%? Above all, understand your competition and spend some time checking out the Undermine Journal. Know who your competitors are, or rather just understand where they are, and where they're not. The examples I gave here may or may not work on your realm. On mine, they worked consistently. In your case, I suspect they'll either work consistently, or "not work" consistently. Because most of your competitors who are very successful are probably following a similar approach: They're doing the same thing over and over, so once you find something that works, you can keep doing the same thing over and over too. I hope this is helpful to you guys, and to all of you who are already doing these things and are likely to take a significant hit to your profits- my sincere apologies. cheers, hopefully will get a bit more cash to spend on new armour! Thanks for the tips, will come in handy. Gold- i am shut,whtz next? excellent guide. glad I'm following you. As a former millioniare in WoW gold, I can say this is useful advice. Im gonna be rich! i never even thought about doing half of these. Ah memories of the days trying to save up to get 40g for my level 40 mount! Very interesting post, I will be rich in no time. Really good advice, thanks for this! Hell yeah, spidersilk boots are a big profit margin on my server. I can make them for 20G and Sell them for 80! awesome, thanks. im about to try this! Ahh thanks for the tips man! Certainly helping out a treat!